From Grodås (on E-39, north of Stryn), take Hwy. 60 signed for Stranda. After passing the exit to Hellesylt, drive through 2 long tunnels. The second tunnel exits into the upper end of Strandadalen. Continue about 3.3 kilometer. At the lower end of an avalanche protection tunnel, you are at the farm Røyr. Find parking here, location N62.18725, E006.92495, elevation about 420 meter. Looking uphill from Røyr, one will see the best route going up on the left (north) side of a pronounced bump (cliff) in the hillside. Start up along the side of a farmers field, higher up, the terrain is easy to walk since the trees are well separated. When on snow, ascend near the creek and gradually more south-east in order to reach the flat area on top of "the bump". Proceed south and cross Haukhammardalen, aiming directly for a very distinct col between the sharp mountain (elevation 1222 meter) on the right (west) and the main mountain (left). When you reach this col, (N62.18238, E006.95624, elevation about 1080 meter), turn left and enter a very nice and natural ramp that gently ascends to the north-east. There are a few small cairns here. Higher up, going slightly more east, it is easy to reach the col between Flosteinnibba (south) and Overvollshornet (north). Leave your skis here and proceed on foot (Ice axe and crampons may be useful depending on the conditions.) 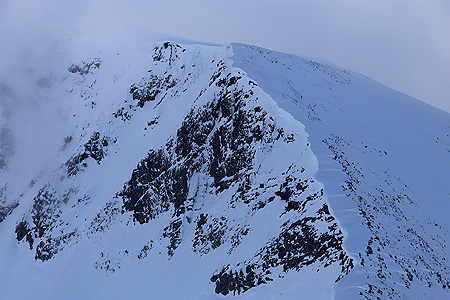 Beware that the cornices may extend far out on the left (east) side of the ridge. Stay where rocks are visible. You will first reach a pretty good sized, flat plateau. Further onwards the summit area is connected by a somewhat more narrow passage. The summit cairn has been built on the very edge of the steep cliff. Today was the National Constitution day, we wanted to have an early start, then drive back to Bergen for a proper dinner. We got up shortly after 0400, washed the rented cabin and drove to the trailhead. Start at 0530, the terrain was very friendly and this skiing route is indeed very nice all the way to the main saddle below the summit. We had a few stops along the way, still arriving at the summit in 3 hours at 0830. The sun came out from the clouds and we had a very nice stay on top. Next, we descended back down to the col, then skied on very easy slopes to the summit of Overvollshornet. Leaving this summit at 0915, we next had a long and nice downhill ski all the way to the spot where we had started skiing. With a few more rests along the way, we arrived back at the car by 1030.